FILE - U.S. President Donald Trump is shown with North Korea's Kim Jong Un on Sentosa Island, in Singapore, June. 12, 2018. The abrupt cancellation of high-level talks between the United States and North Korea suggests denuclearization negotiations between Washington and Pyongyang have hit a snag, experts said. 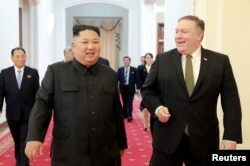 Secretary of State Mike Pompeo was scheduled to meet with Kim Yong Chol, vice chairman of the North Korean Central Committee, in New York City last week. However, the meeting was abruptly called off at the last minute. Nikki Haley, the U.S. ambassador to the U.N., said Thursday that Pyongyang canceled the meeting, in which discussions about the second summit between leaders Donald Trump and Kim Jong Un were to take place. "I do think the talks are going to be rescheduled," said Haley. "And it doesn't change the fact that the summit is still scheduled for the president and Kim to meet after the first of the year." U.S. State Department deputy spokesman Robert Palladino said, "This is a case [where] we are dealing with a purely scheduling issue, and it's just simple as that." After the cancellation, Trump said, "We're going to make it at another date." He continued, "But we're very happy how it's going with North Korea. We think it's going fine. We're in no rush. We're in no hurry." Despite these assurances from the Trump administration that the talks will resume, experts remain skeptical. "I think it is more than a scheduling issue," said Robert Manning, a senior fellow at the Atlantic Council, a global affairs research group in Washington. "The negotiation process appears stuck." FILE - Evans Revere, former U.S. deputy ambassador for East Asian affairs, speaks to the National Committee on American Foreign Policy and a North Korean delegation led by Vice Foreign Minister Ri Yong Ho, at the Korea Society in New York, March 10, 2012. Evans Revere, a former State Department official who negotiated with North Korea, said he thought the cancellation of the talks indicated that negotiations about denuclearization had stalled because of growing differences between Washington and Pyongyang. "There is a serious gap between Washington and Pyongyang over the issue of denuclearization," said Revere. "There is an equally major gap on the issue of sanctions, with [North Korea] pushing for the U.S. to remove sanctions in order to improve relations and build confidence between the two sides, and the United States making clear that sanctions easing will not happen unless and until North Korea verifiably denuclearizes." Breaking the impasse on denuclearization, according to Daryl Kimball, the executive director of the Arms Control Association, will be difficult as neither side wants to back down from its position. Kimball said, "The cancellation of the meeting between Secretary Pompeo and Vice Chair Kim Yong Chol is disappointing but not surprising, given that neither side appears to be ready to take the necessary action-for-action steps on denuclearization and peace that would move the process along." Gary Samore, the White House coordinator for arms control and weapons of mass destruction during the Obama administration, said the meeting was called off because Washington and Pyongyang realized progress is unachievable at this time. "I assume the meeting was delayed because both sides realized that significant progress is not possible at this time, due to the major differences between the U.S. and [North Korea] on denuclearization," said Samore. Michael Fuchs, deputy assistant secretary of state for eastern Asia and Pacific affairs during the Obama administration, said he believed Pyongyang was delaying lower-level negotiations to stave off pressure until it talked directly with Trump. "I think that it's a reinforcement of a notion that the North Koreans are trying to drag out this diplomacy as long as possible and that they want to deal as much as possible directly with President Trump," said Fuchs. FILE - North Korean leader Kim Jong Un meets with U.S. Secretary of State Mike Pompeo in Pyongyang in this photo released by North Korea's Korean Central News Agency (KCNA), on Oct. 7, 2018. After Pompeo went to Pyongyang in October, Steve Biegun, the U.S. special representative for North Korea, was expected to meet with North Korea's vice foreign minister, Choe Son Hui. But that meeting never took place. The deadlock in the Washington-Pyongyang talks cast doubt on prospects for North Korea's denuclearization, experts said. "At present, I see no imminent prospect for real dismantling of [North Korea's] nuclear weapons program and facilities," Manning said. According to Revere, Pyongyang believes it can keep nuclear weapons and maintain its relations with Washington at the same time. "I continue to believe that Pyongyang does not intend to give up its nuclear weapons capability," said Revere. "I also continue to believe that [North Korea] believes it is possible to have normal relations with Washington and Seoul and keep its nuclear weapons." Instead of demanding complete denuclearization, Samore said, a realistic prospect is to limit North Korea's nuclear weapons program. 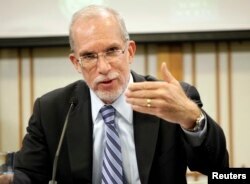 "Complete denuclearization was never a realistic prospect," said Samore. "The only question is whether North Korea will accept meaningful limits on its nuclear program." On Nov. 8, Pyongyang rejected a report by the International Atomic Energy Agency (IAEA) that expressed concern over North Korea's continued development of its nuclear program. The agency described this as "deeply regrettable and clear violations of relevant United Nations Security resolutions." 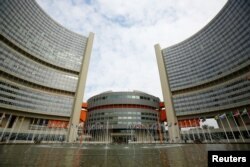 FILE - The International Atomic Energy Agency's headquarters are pictured in Vienna, Austria. “This shows that the IAEA has lost its impartiality as an international organization and is being abused for impure political purposes," the ambassador said. More than a dozen undeclared missile bases were identified in new satellite images of North Korea, according to a report released Monday by Center for Strategic and International Studies, a U.S. think tank in Washington. Trump responded by calling the report "fake news" adding "We fully know about the sites being discussed, nothing new — and nothing happening out of the normal."